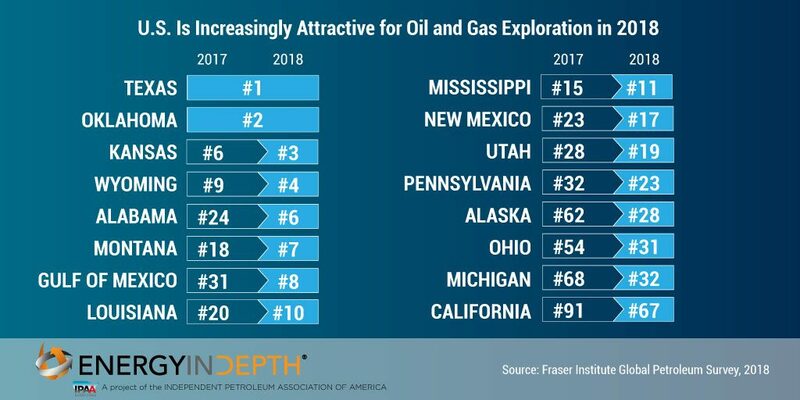 The United States continues to lead the world in attractiveness for oil and gas investment and its lead is increasing, particularly in the Gulf and Mountain states, an annual survey of senior global petroleum industry leaders found. 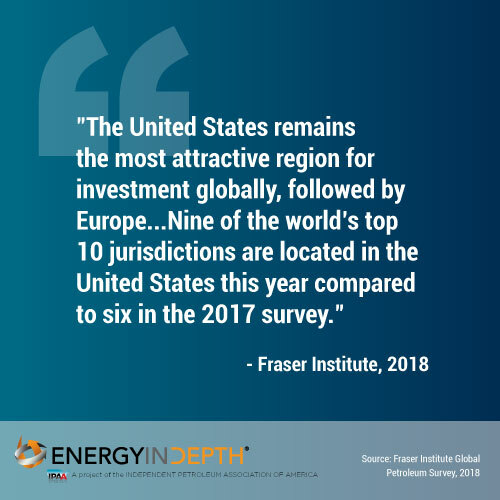 The survey conducted by the Fraser Institute found that nine of the top 10 jurisdictions for investment are in the United States, led by Texas, Oklahoma, Kansas, Wyoming, and North Dakota. Most U.S. jurisdictions improved their ranking in this year’s results. Last year, only six of the top 10 locations for investment were domestic. 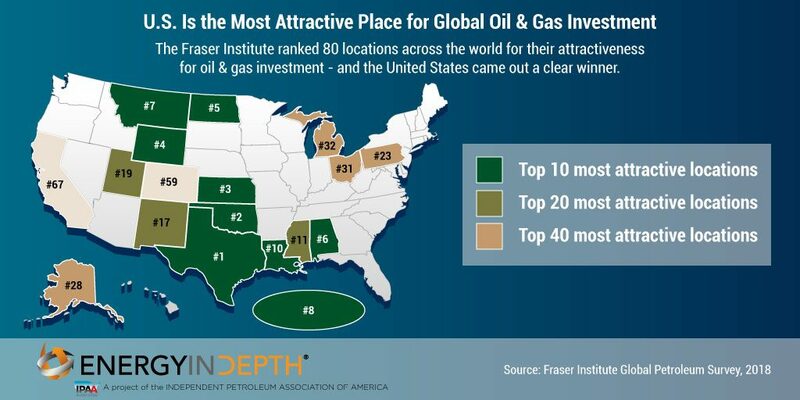 This is the second year Texas was ranked the best jurisdiction for investment globally, followed by Oklahoma. The survey included responses from 256 executives who operate in 80 areas around the world, representing 53 percent of proven oil and gas reserves and 68 percent of global oil and gas production. Respondents were asked to rank jurisdictions on policy related measures such as tax burden, regulations, trade barriers, their legal system, and political stability. Gulf Coast states ranked particularly high, even those not historically considered oil and gas powerhouses. Increased upstream investment has prompted more downstream activity such as LNG terminals and petrochemical manufacturing in the Gulf, pushing states like Alabama and Mississippi into the category of active states such as Texas and Louisiana. However, not all U.S. jurisdictions have a high ranking. California, Colorado and offshore areas in Alaska ranked in the third quintile, making them the lowest ranked U.S. jurisdictions in the survey. Other jurisdictions in the third quintile include Egypt, Myanmar, Nigeria and France. No U.S. jurisdictions were in the fourth quintile. California ranked lowest among U.S. jurisdictions despite improving from 91st out of 97 in 2017 to 67th out of 80 in 2018, due to decreased concern over labor regulations, protected areas and relative political stability. Colorado dropped from the second to third quintile from 2017 to 2018. A participant cited increased “political activism directed towards the fossil fuel industry” as a reason for the decrease. While Colorado and California are both targets of “Keep it in the Ground” activists, Colorado voters in November rejected a proposition that would have essentially banned new oil and gas development there, just as California voters rejected a proposition banning fracking in San Luis Obispo County. It is too early to predict whether either of these developments will improve Colorado or California’s ranking in 2019. The overwhelmingly positive survey results for U.S. jurisdictions mirrors other indicators for the U.S. oil and gas industry in 2018. The IEA recently projected that the country will continue to dominate global growth in oil and natural growth through 2025 and the U.S. surpassed Russia as the world’s largest crude oil producer this year.